The 2008 chrysler aspen electric vehicle qualifies for a federal tax credit of up to $7,500, effectively reducing the net base price. On the surface, creating a new large SUV in the current market might seem a little like arriving at a party just as it's breaking up. Scratch that surface, though, and a rationale emerges. The segment for large sport utility vehicles, while shrinking, is still substantial, and Chrysler has had no player in this market. 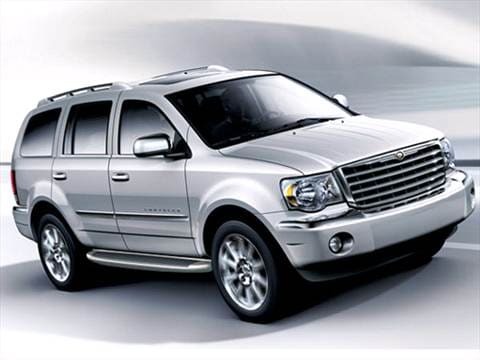 Based on the successful Dodge Durango platform, the 2008 Chrysler Aspen is an elegant addition to the large SUV landscape, one that gives buyers a way to remain in the Chrysler family when their own families outgrow the Town & Country minivan. If your lifestyle regularly requires a vehicle with room for six or seven people, or lots of cargo, or you tow a trailer, or your travels or your climate make four-wheel drive more a necessity than a nicety, you now have another quality choice for your shopping list. Perhaps higher fuel prices took you out of the large SUV market, or perhaps you never really needed one in the first place. If so, you may find that a mid-size SUV, or a station wagon-like crossover, makes more sense and will use less gas, too. The 4.7-liter E-85-compatible V8 engine bumps up the horsepower and refinement considerably. Chrysler's MyGIG multimedia audio system now includes a rear back-up camera. On the road, the Aspen has a well-cushioned ride fit for the longest road trip. Too big to be agile, the Aspen nonetheless handles with sure stability, and that includes during towing. Rearward visibility to the sides is hindered by wide C- and D-pillars. Four-wheel-drive models with the 4.7-liter V8 get a single-speed transfer case, while 5.7-liter powered four-wheel-drive models pack a two-speed unit, with all-wheel-drive and four-wheel-drive high and low modes. Few Aspens are likely to be called upon to venture off-road, but for such situations there is an optional skid plate package that provides protection for the transfer case and fuel tank (standard on J Package four-wheel-drive models). The optional 5.7-liter V8 and five-speed automatic transmission combination is smooth and powerful. The HEMI engine is responsive on the road and strong enough to tow a maximum of 8,900 pounds. Aspen doesn't have a bad seat in the house. If your passengers complain, it will be about your driving, not their accommodations. The Aspen has a roomy, refined interior and seats seven to eight people in three rows. Getting in or out of the third row doesn't demand the nimbleness of a gymnast, and those consigned to the third row won't feel slighted. With the maximum number of passengers on board, minimum cargo capacity is 20 cubic feet. Both second- and third-row seats fold nearly flat, and storage space increases accordingly from big (68.4 cubic feet) to bigger (102.4 cubic feet). Lift-over height in back is low, and the opening is usefully wide, but those over six feet tall will need to duck under the liftgate door when loading luggage or lumber. The latest editions of the Cadillac Escalade and Lincoln Navigator sport enough brightwork on their front ends to make a 1950s car blush but, by comparison, the Aspen's face comes off as conservative - which isn't necessarily a bad thing. The four-bar grille is capped by a winged, heritage badge, and hood strakes are similar to those on Chrysler's Crossfire sports car. Buyers who want to boost Aspen's bling factor can opt for the 20-inch, 10-spoke chrome rims. The Aspen otherwise strikes a traditional SUV profile, with beefy, squared-shoulder styling. The Aspen is available in two trim levels; E Package and up-level J Package. Both versions are offered in two- or four-wheel drive. Standard equipment in the Aspen Limited E includes an E85-compatible 4.7-liter V8, Electronic Stability Program, light-emitting-diode (LED) interior lighting, stain-resistant interior fabric, power driver's seat, reclining second-row seats, 60/40-split third-row seat, AM/FM stereo with MP3 compatible CD, side-curtain airbags, roof rails and 18-inch aluminum rims. The J Package includes the HEMI V8, 20-inch chromed wheels, Premium audio with a 20-inch subwoofer, heated leather power front seats, power liftgate with ParkSense, SIRIUS Satellite Radio and automatic temperature control. The Aspen can be optioned with a variety of information and entertainment features, including a navigation system, SIRIUS Satellite Radio (standard on J Package) and a rear-seat DVD entertainment system. Aspen J models are also equipped with a number of features that can be added as stand-alone options on E versions, including the 5.7-liter HEMI V8 and running boards. The standard powertrain in the Aspen is a 4.7-liter V8 matched to a five-speed automatic. The 4.7-liter is E85-compatible, and thus able to run on gasoline, ethanol or a mixture of the two. Optional is Chrysler's 5.7-liter HEMI V8; somewhat surprisingly, the bigger engine provides significantly more power and torque with fuel economy that's actually a little better. The 4.7-liter works well in the Aspen platform, but if you can swing the extra money ($990), there's really no incentive not to buy the HEMI, as it offers more "go," more "tow" and better fuel economy than the smaller engine. The Manufacturer's Suggested Retail Price (MSRP) for an Aspen Limited E Package with two-wheel drive starts around $33,000 and jumps to almost $36,000 with all-wheel drive. A fully-loaded all-wheel-drive Aspen with the J Package and the HEMI V8 tops out around $45,000. Fair Purchase Prices - the prices consumers are typically paying for these models - ran slightly less than the MSRP last year, so be sure to click on the Fair Purchase Prices link for more recent information. The Aspen lacks the track records of such competitors as the Cadillac Escalade, Lincoln Navigator and Lexus LX 470, but counters with comparable content at a price that's thousands less than the least expensive of the others. As for resale, the Aspen is not expected to hold steady with the likes of the Cadillac Escalade or Lexus LX 470, but it does hold average five-year values similar to the Lincoln Navigator and Nissan Armada. Ive had this car for over 9yrs. Been great..
Great car. 5.7 Hemi is one of the best.